In 1995 Pete Sprankle tried taking his art in a new direction and attended the New York Film Academy in Manhattan. He learned the basics of filmmaking and shot a 6 minute short called “Do You Have the Time?”, with a brief cameo by Ellen Pompeo if TVs Gray’s Anatomy, who at the time was working as a waitress at his friends bar. 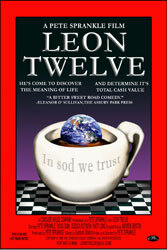 In 1996 He decided to attempt making his own film “Leon Twelve” which he wrote, produced, directed, starred in and financed out of his own back pocket for less than $15,000. The film is a low budget intellectual comedy about a man sent to Earth to discover the meaning of life and determine it’s total cash value. After moving to Los Angeles in 1999, and having no success finding a home for “Leon Twelve”, Pete decided to go back to school and studied storytelling, animation, editing, and visual effects at Santa Monica College. Finally in 2007 after writing several screenplays, with no success even getting one read, he once again decided to take the industry in his own hands by making his second independent film. This next project called “Channel Surfing” is a satirical comedy making fun of reality TV and pop culture. It is a series of 30 or so short films that are all liked together by the same characters to tell the story of a twenty something ex-child star who is now not only trying to regain the fame he has as a kid, but also earn respect as an artist and not just be famous for the sake of being famous. To see his films you can go to YouTube.com/petespranklefilms or YouTube.com/leontwelve.